Today, I took Serts out from the house for a conditioning ride. I was hoping to take Tanna out with us on a lead rope, but his left hind shoe is quite loose and one of my easyboots busted the cable when I tried to put those on. So Serts and I headed out alone. We were on our way back, headed for a 15+ mile ride when Serts tripped and went down on his left side. When we both righted ourselves, I was pleased to find my left leg was still intact. But Serts had pulled his left front shoe off (which made him trip in the first place) and scraped up the stifle on his left hind pretty good. Serts wasn't lame at all. I used some Kleenex to clean the blood off and noticed one cut was still bleeding. It bled slowly for several minutes before finally stopping. I hand-walked Serts for awhile, then mounted and we headed back home at a walk. I finally got ahold of Daniel and he hitched up the truck and met us about 2.5 miles from home. Serts is still not lame and seems ok. Not stiff, just with that wound. I am treating it with blue wound spray. Hopefully it will clear up nicely without issue in time for Big South Fork. Oh....that looks like an ouchie. Phebes fell with me on Friday, we slipped on grass and I was thinking as my leg went under "this is gonna hurt". 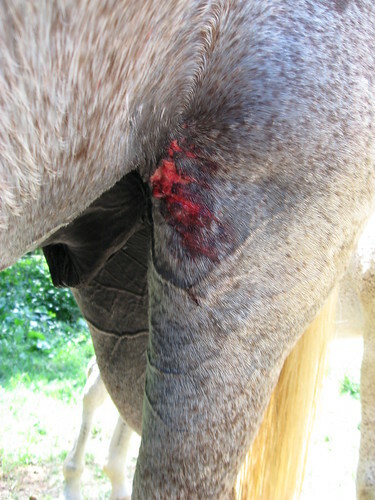 As it turned out my leg was fine but I was gored in the gut by my saddle horn which did hurt, and bruised up my arm too somehow. Falling down, definitely NOT a good thing. Glad you all came through alright. ~E.G. I'm pretty sore today, especially my neck and left thigh, but not horrible. Serts is doing well. Going to head out to give him some sugar cubes and check on him.